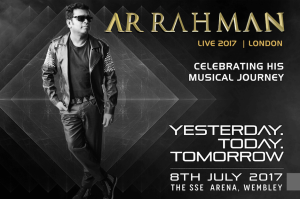 Tuesday 13th June 2017 – Academy Award (Oscar) two-time winner and five-time nominee; Grammy two-time winner; BAFTA; and Golden Globe winner, the legendary AR Rahman, returns to the SSE Arena Wembley on Saturday 8th July 2017 after seven years with the “Yesterday, Today, Tomorrow” concert. Celebrating 25 years since his acclaimed, music debut Roja, the visionary composer will be joined onstage by very special guests including Benny Dayal, Javed Ali, Neeti Mohan, Haricharan, Jonita Gandhi, Ranjit Barot and many more. “Yesterday, Today, Tomorrow” is presented by Hamsini Entertainment, UK and HueBox Entertainment, India.